John Gillies on the left, and Bob Cherry with a full head of hair in the yellow t-shirt. It's Donald Cameron in the pencil outfit! Looks like Chay Ross behind John Gillies. It is my granda Geordie Young and my uncle Charlie far right near the tractor! Yes that is Charles Young my brother and my father George Young. Charles lives just outside Boston in the USA. My father lives in Cromarty. Think you could be correct Paul, and is that not Joyce Kelly on Heddy Hoggs right shoulder? I believe the person with their back to us in the blue could be Fiona Chis! 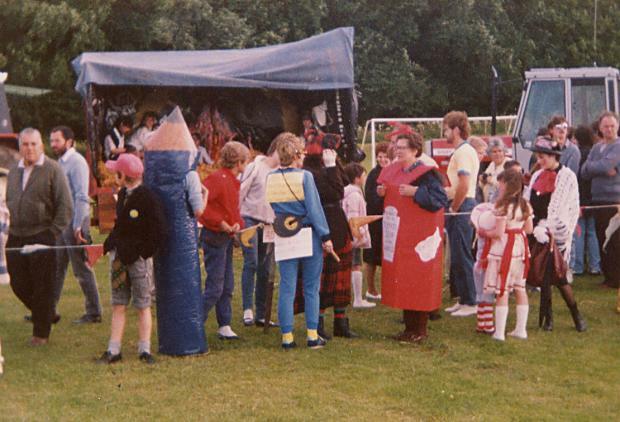 I think the one in blue with her back to us is Rosemary Lewis speaking to her mum Heidi in the tomato soup outfit. You're right, Ronald, that's definitely Rosemarie and Auntie Heddy. Behind John Gilles is Charlie MacIver with hair! Does anyone remember who won the fancy dress parade............ let me remind you. It was the Hourston, Tonkin and MacMillan kids with their version of Dr Charlies Angels. Not the first time I won. My brother and I won in 1980 with Beechgrove Garden.